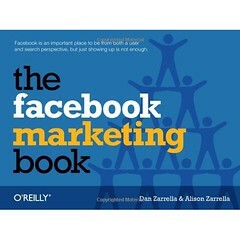 Note from Beth: Alison Zarella is the co-author of the recently published “The Facebook Marketing Book.” I received a review copy from O’Reilly. The book is not only an excellent reference for many Facebook questions, but also provides tactical recommendations for an effective Facebook content, engagement, and measurement strategy. 1. You’ve just co-written a book with your husband, Dan Zarrella called “The Facebook Marketing Book.” What was it like to co-write a book with your spouse? We wrote this book while we were in the middle of planning a wedding, and were actually editing on our honeymoon. But that’s just the way we are. We used to work together and would hang out after work and talk shop. Our dinner conversations still inevitably turn to social media in some way or another. This book was definitely a labor of love, but in a good way. We probably sound boring to other people but we’re both genuinely interested in the nuances of Facebook and how it applies to marketing. 2. The book offers lots of great advice on using many of Facebook features like Events. What are some of best practices for success? The key with using any of Facebook’s features is to take full advantage of the tools available to you. So many people don’t bother to fill out all the information for an Event (or a Page or Group) and so they’re missing out on important messaging, keywords and calls to action. In some cases you’re even hindering functionality if you don’t include open settings to allow invitees or members to post content to the Wall as well. And the quickest way to break through the clutter is simply to include an image and use proper grammar and punctuation. It’s simple and will help you stand above at least half of the Events out there. 3. Given the design restrictions on Page design, having a solid content strategy can get results and help differentiate your nonprofit. How you break through the clutter? One of the quickest and easiest ways to differentiate your Page is through content. All it takes is a little creativity and copywriting. No coding ability, no design skills. Include links or photos with your status updates to help your posts stand out in the Newsfeed and draw more attention to your Page. Focus on engagement by asking questions or suggesting people “like” a post. Every comment or “like” is an interaction with your Page that is viewed like a vote for its content and increases your prominence in the Newsfeed. 4. Content strategies are often the most difficult task for many nonprofits. Can you share an easy step-by-step way to think this through? I can’t stress enough how important it is to plan ahead so you aren’t scrambling to come up with a post at the last minute. When it comes to actually writing your content, I find that having a theme for every day helps. Create a content calendar and plan for Monday to be videos, Tuesday featured fans, etc. This helps you focus when writing and makes planning ahead easier. Think about tie-ins to holidays, other marketing messaging, and creating a synergy between Facebook posts and email newsletter or Twitter updates. Be flexible with additions to your calendar, but use it as a guide and plan as far ahead as you feel comfortable, either by topic or actually writing out the full text. 5. One of the most common questions I hear is “How often should we post content to Facebook?” How should a nonprofit make that decision? Any guidelines? 6. Tell me more about how a nonprofit can best optimize their content for both FB and Search Engines? If you’re setting up a new Page, make sure you choose the correct category and that it allows for plenty of space on the Info Tab. Explain in-depth where it asks about your history, mission, etc. Include keywords where you can, especially in the Info Box on the Wall Tab. And of course, choose your Page title and URL carefully. (They’ll probably be your organization name.) All these steps will help you rank in natural search as well as Facebook. Include keywords in your status updates as well for even more Facebook search results. If you want to go a step further you can create a basic FBML tab with keyword-rich content and links as well. 7. Many nonprofits want to be a effective as possible in driving traffic to their own sites from Facebook (and vice versa), what are some best practices for getting your content shared on Facebook? Content that gets shared most on Facebook is easy to read, in terms of reading level and length of text. Short, easy to read posts are more likely to get shared across the site. Stories with a positiver angle also perform better, so always try to look on the bright side of things. Getting into the “how and why” of news stories also does well. And, not surprisingly, articles mentioning Facebook get shared more often on the site. But no matter what you’re talking about, remember to factor in time differences and post accordingly. Studies have shown that 3pm EST seems to drive the most engagement with a post. 8. What are you some efficient techniques for monitoring responses on Facebook? Do you have to respond to everyone? What is your best advice about moderation and dealing with spammers or trolls? There are lots of free (and paid) social media monitoring tools. Depending on the size of your Page, these can be an absolute essential or just kind of nice to have. Either way, they should never completely replace real human eyeballs checking out what people are saying and responding when necessary. To keep things efficient, schedule time twice throughout the day to check Facebook comments and don’t look between those times. Block out a few minutes for yourself to answer questions at these times and do your best to respond to genuine complaints or comments. I’d recommend even posting quick responses to positive posts that don’t necessarily require follow-up, just to keep the goodwill going. As for trolls and spammers, create a social media policy and stick to it. (You might even want to post this on a tab somewhere.) A good rule is that abusive or foul language will be removed, as well as overtly promotional links that don’t apply to your mission or interest. But let genuine complaints stay up there, and respond to them. And if you see the same question over and over, use that to guide your content strategy and write a status update addressing this common question. Alison will join us in the Zoetica Salon to answer your Facebook questions. Alison Zarrella is a social media consultant who has worked with brands of all sizes, ranging from international companies to local businesses. A self-described Facebook fanatic, Alison has over 7 years of experience on the social network and recently co-authored The Facebook Marketing Book with her husband Dan. She can be found on Twitter @Alison, or on her blog AlisonZarrella.com, where she talks about social media marketing, online shopping, and of course, Facebook. This is great and really helpful–thanks for sharing your experience with us, Alison. However, I feel like I keep getting conflicting info on FBML. I thought that it was definitely going away at this point as Facebook moves towards iFrames. Plus, with the new FB profiles, tabs are pretty much disappearing, so I was under the impression that custom “tabs” wouldn’t even be an option soon…. Updates? And/or recommendations on a place to go for Facebook Page update information without having to read through a bunch of superfluous posts? It’s important to think about how you will promote your Fan Page as well. This is where your regular account comes in handy: you can join industry groups, location based fan pages, other groups that are related to your business or where your target customers are. You can promote your brand via comments, shared links, etc. Connect, build relationships, invite your new friends to join and get active on your Facebook Fan Page. What a great resource and what good ideas! I will certainly add it to my list of must-reads for social media guidance. Great ideas specially for me who is very ignorant in this respect. Excellent advice. I conduct trainings on media advocacy and provide examples of content ideas for Facebook pages. I will share this blog post in future classes, as it’s just the type of practical information people need. How to deal with spammers and negative posts is a big issue for those who work for causes and issues. Wonderful Facebook event advice! I really like your tips on how to cut through the clutter and planning out what topics to cover over time. Any ideas on how effective advertising on Facebook for an event is? Thanks for the great post. Checking in 2 times a day and leaving time to comment is a very good habit. I can’t wait to read your new book.